To be a place of great love and great learning, built on Christian values, where everyone thrives on encouragement, support and challenge. We aim to be a vibrant and loving school where expectations are high and where effort and excellence are celebrated. Individuality, creativity and independence are fostered and everyone learns in a happy, safe and supportive environment. Our school is dedicated to continually improving the quality of the educational provision for all of our pupils, so that they may achieve their full potential and leave this school prepared for the demands of society in their future. Our vision is to achieve excellence through high quality education for all pupils regardless of background, and equip them with lifelong skills which support their holistic development. 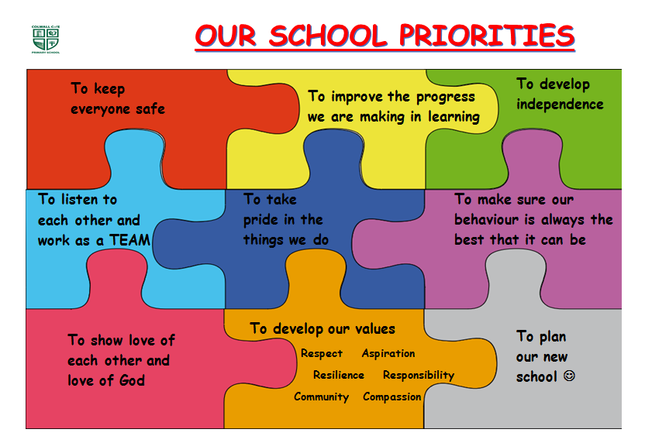 We have three overarching Christian Values which encapsulate the ethos of our school. We have a clear set of aims which form the foundation of our work. To provide love, support and encouragement in an environment where children feel safe and thrive. To provide a broad, balanced, high quality curriculum to every child, in a vibrant and inspiring environment that they can enjoy. To prepare every child for the future to enable them to become responsible and caring members of society.